Western blot analysis of extracts from various cell lines using VAMP3 (D9S6K) XP® Rabbit mAb (upper) and β-Actin (D6A8) Rabbit mAb #8457 (lower). VAMP3 expression is undetectable in Daudi extracts, as predicted from published gene expression databases. 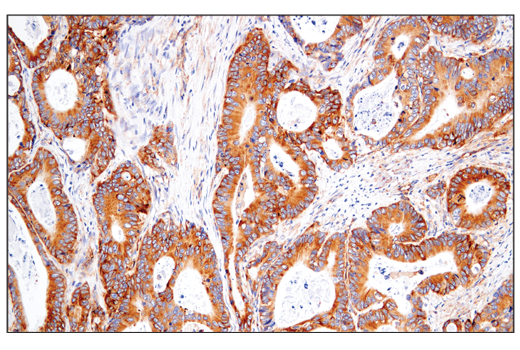 Immunohistochemical analysis of paraffin-embedded human colon carcinoma using VAMP3 (D9S6K) XP® Rabbit mAb. 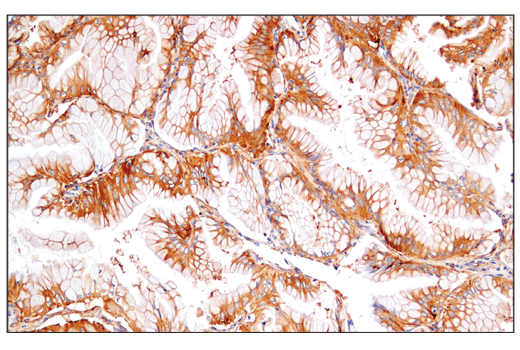 Immunohistochemical analysis of paraffin-embedded human lung adenocarcinoma using VAMP3 (D9S6K) XP® Rabbit mAb. 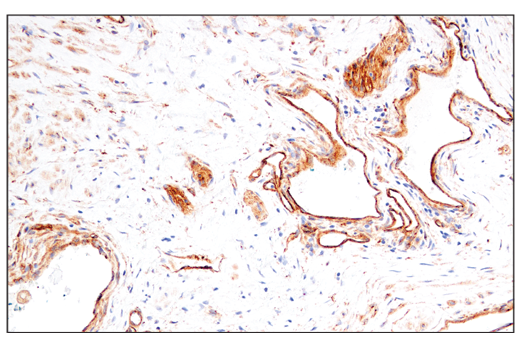 Immunohistochemical analysis of paraffin-embedded human squamous cell lung carcinoma using VAMP3 (D9S6K) XP® Rabbit mAb. 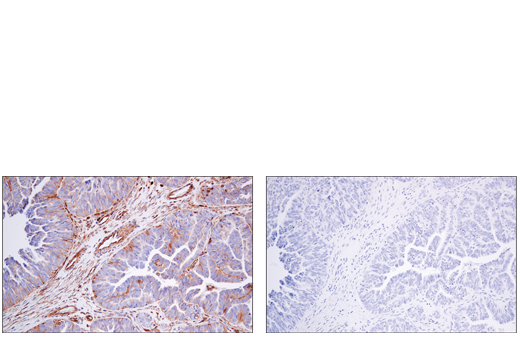 Immunohistochemical analysis of paraffin-embedded human serous papillary carcinoma of the ovary using VAMP3 (D9S6K) XP® Rabbit mAb (left) compared to concentration matched Rabbit (DA1E) mAb IgG XP® Isotype Control #3900 (right). 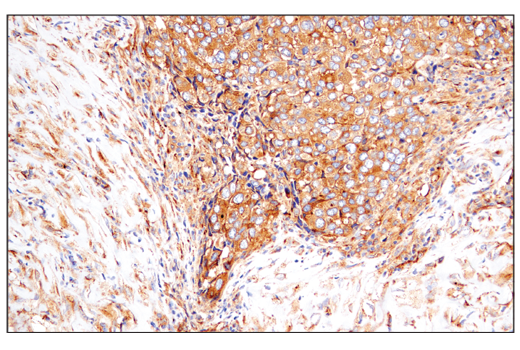 Immunohistochemical analysis of paraffin-embedded human pancreas using VAMP3 (D9S6K) XP® Rabbit mAb. 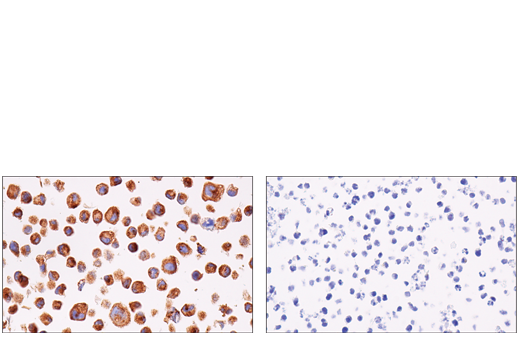 Immunohistochemical analysis of paraffin-embedded 786-O cell pellet (left, positive) or SU-DHL-4 cell pellet (right, negative) using VAMP3 (D9S6K) XP® Rabbit mAb. 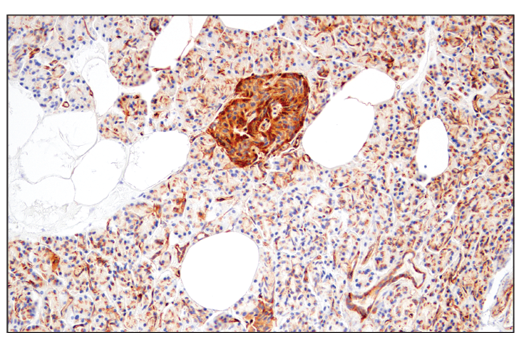 Immunohistochemical analysis of paraffin-embedded human prostate carcinoma using VAMP3 (D9S6K) XP® Rabbit mAb. 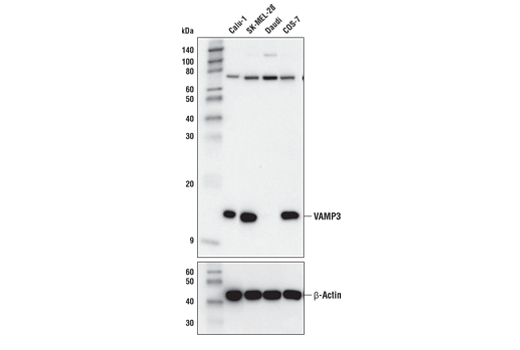 VAMP3 (D9S6K) XP® Rabbit mAb recognizes endogenous levels of total VAMP3 protein. Monoclonal antibody is produced by immunizing animals with a synthetic peptide corresponding to residues surrounding Ala8 of human VAMP3 protein. Proteins in the soluble N-ethylmaleimide-sensitive factor attachment protein receptor (SNARE) complex are integral membrane proteins involved in vesicle transport and membrane fusion by pairing of vesicular SNAREs (v-SNAREs) with cognate target SNAREs (t-SNAREs) (reviewed in 1,2). Vesicle associated membrane protein 3 (VAMP3), also known as cellubrevin, has a broad tissue distribution and localizes to endosomal compartments (3). VAMP3 interacts with the t-SNAREs syntaxin1, syntaxin4, SNAP23, and SNAP25 (4,5). Research studies indicate that VAMP3 is involved in transferrin receptor recycling to the plasma membrane (6) and in T-cell receptor recycling to immunological synapses (7). Inhibition of VAMP3 with tetanus toxin impairs membrane trafficking during cell migration (8). Jena, B.P. (2011) Adv Exp Med Biol 713, 13-32. Kasai, H. et al. (2012) Physiol Rev 92, 1915-64. McMahon, H.T. et al. (1993) Nature 364, 346-9. Chilcote, T.J. et al. (1995) J Cell Biol 129, 219-31. Schraw, T.D. et al. (2003) Biochem J 374, 207-17. Galli, T. et al. (1994) J Cell Biol 125, 1015-24. Das, V. et al. (2004) Immunity 20, 577-88. Tayeb, M.A. et al. (2005) Exp Cell Res 305, 63-73.